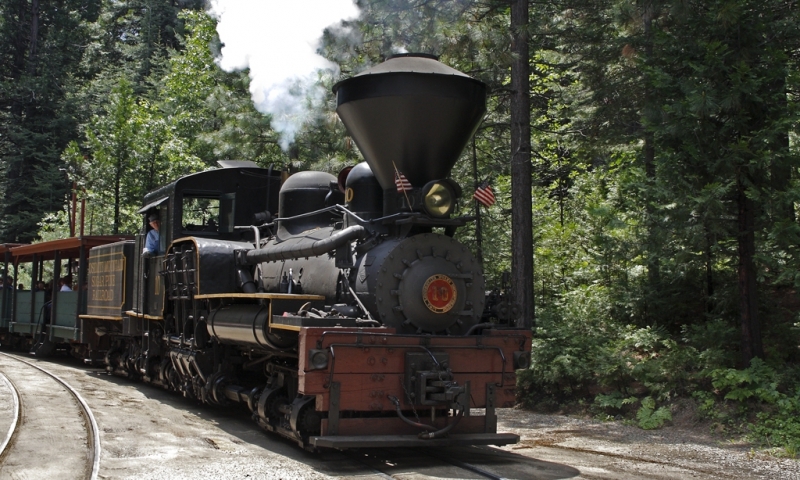 Sugar Pine Railroad in the Sierra Nevada Mountains south of Yosemite offers exciting railroad excursions where you can experience riding on a historic locomotive with majestic forests as a backdrop. Yosemite Sugar Pine Railroad takes you on a four-mile ride into the woods of Sierra National Forest. It’s a journey back into time and provides the sights, scenes and sounds of the original travelers on this rail line. The Sugar Pine Train is located in Fish Camp, California, south of Yosemite. From Yosemite Village, take California Highway 140, turning right on Wawona Road (Highway 41) to Fish Camp. The drive only takes about an hour. Contact information: 559-683-7273 or visit their website. The Yosemite Train operates all year. For winter hours from November through February, you will need to call the park. The Yosemite Railroad was originally used to transport wood from surrounding forests to various destinations. Two of the large locomotives that pulled these original trains still survive and are used to give rides to visitors today.